Take Away Senior Discounts? Epic vs Ikon, Italy Update 2, Mystery Cable Car, Mammoth And Jackson Hole In Spring. The point of the article is that while seniors figure they’ve “earned” discounts on movie tickets, donuts, clothing, access to National Parks, transportation, and the like, there are others who feel they don’t deserve them anymore. “Some question whether senior discounts are warranted in an era when many of those enjoying them are relatively well off, while large numbers of younger folks strain under the weight of student debt and labor in a gig economy bereft of benefits,” the article states. The article goes on: “David Wallis, who leads the Economic Hardship Reporting Project, a nonprofit that supports journalism focused on inequality, argues that the deals for seniors are a relic of an earlier time. He calls for replacing them with income-based discounts for people of all ages. The rest of the article posits that debt-burdened millennials need discounts, too, so why not have a means-based approach to discounts, economy wide? The logic behind “Time to retire these discounts?” (April 8) is based on the assumption that older people have adequate resources, therefore discounts are unnecessary. It smacks of narrow thinking, focussed on self-sufficiency and the notion that businesses shouldn’t subsidize certain demographic populations because there is money out there. Why leave it on the table? Yet, we find some businesses use senior discounts as a key differentiator. What would AARP be like if it stop offering discounts to members? How about the AAA? Clearly, senior discounts mean value to older folks, regardless of means, and most businesses know it and use them to advantage. But not every business sees the value that discounts for seniors bring. 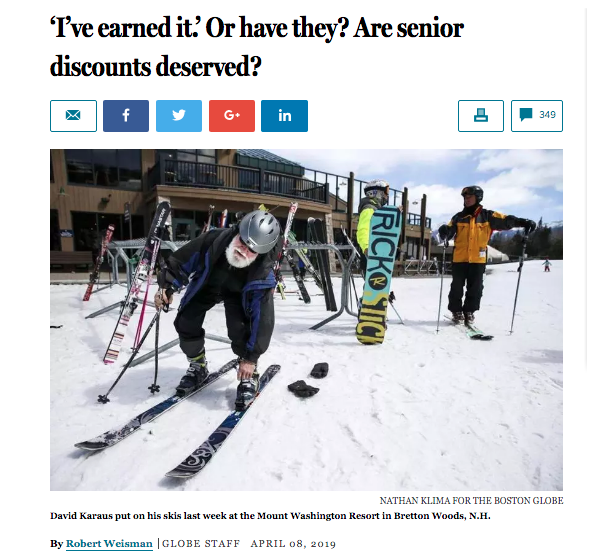 Vail and the Epic Pass have denied seniors a discount, despite the fact that older skiers play a major role in introducing new skiers (grandchildren) to the sport, a significant, unrewarded service to the ski industry. And older skiers have been supporting that industry for as long as 50 years or more. These committed customers deserve both encouragement and a reward for continuing in the sport and for, yes, generating revenue. Doesn’t that deserve a discount on a lift ticket mid-week when no one else is around? There are many senior skiers who have bridled against the corporate. no-discount for seniors pricing policy, some of whom have given up visiting non-senior friendly resorts. Instead, we know that seniors flock to those areas that do offer senior discounts and even free skiing, keeping the lifts running and the burgers flipping. Offering a discount to seniors is a business differentiator in an increasingly expensive sport. 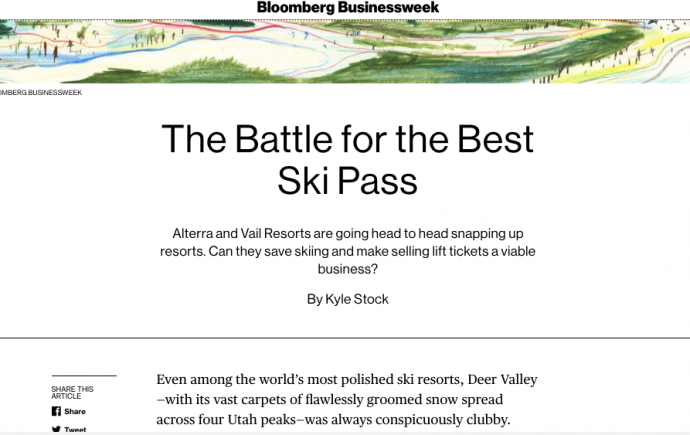 Meanwhile, there was another fascinating article from Bloomberg Business Week on the trend of consolidation of ski resorts and the multi-resort pass. We’ve all felt the impact of these changes, some have benefitted, and some feel they’ve lost out. There is no question the ski resort business will be seeing more changes in the future. For a link to the Bloomberg article, click here. Or click on the image below. Co-publisher Jon Weisberg continues his reporting on the Italian Dolomites, a ski safari that seems to be the crowning experience of anyone’s ski career. 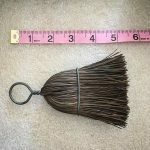 We also have another Mystery Glimpse and reveal the function of that little whisk broom left over from 10th Mountain Division training in the Rockies. Finally, we hear from Marc Liebman on spring skiing at Mammoth Mt, CA., and from David Barnes, a reader who submitted a story about “Gaper Day” at Jackson Hole. Thank you again for reading SeniorsSkiing.com. Tell your friends, and remember, there are more of us everyday and we aren’t going away. Not all seniors can afford the luxury of skiing. The discounts let us continue the winter sport we love and have invested in. For us we have at least 50+ years intone sport. Skis and boots cost have gone up, lift tickets have gone up and so on. Senior discounts help us seniors support ski areas usually midweek when few people are there. Also discounts allow us to go to ski areas outside our territory. If we did not get discounts we would be a dying breed. Enough said. Enjoy the spring skiing folks. I agree, my retirement failed so at 70 I need to work so I can ski. The deals get me there, plain and simple. That is why Vail and EPIC don’t get my money. Totally agree. Discounts enable retired seniors with reduced income to continue to ski and can benefit the resorts mid-week. At 75, I want to still ski. The article in the Boston Globe is besides being inaccurate, simply just stupid. One, according to the National Ski Area Association’s data, Senior Skiers represent roughly 13% of the U.S. skier population is over 55. And us old farts over 55 represent 16% of the skier visits. This percentage has been consistent over the past few years. Two, we also bring people who either want to learn to ski, or people who have dropped out of the sport thereby INCREASING the skier population. NSAA’s own data shows this too because there has been an average annual INCREASE in the number of rank beginners taking up the sport after age 55. Three, most of us are on relatively fixed incomes and have to allocate our discretionary dollars carefully. The data shows we ski, and ski a lot. SeniorsSkiing.com’s own data show we spend more than the average skier below age 55. So, what are these resorts afraid of? We’ll ski 25,000 vertical feet a day. The industry is upside down economically so IKON/Epic is a short term money grab to make their quarterly financial reports look good. If the industry goes ahead and eliminates the senior discounts, it will be killing the goose that lays one of its golden eggs! This week, I renewed my senior pass for $110 at the inside ticket desk at Stevens Pass resort, which is now part of the Epic empire. This deal is not on the website. Also includes 10 buddy tickets. The Boston Globe article is seriously wrong. Look at Victor Polonski’s reply above to see the true income status of seniors overall: MOST of us on fixed incomes are much less wealthy than those in their prime earning years. What has happened is that the corporate ski industry has gradually driven out everyone who is not super rich in all the younger generations. 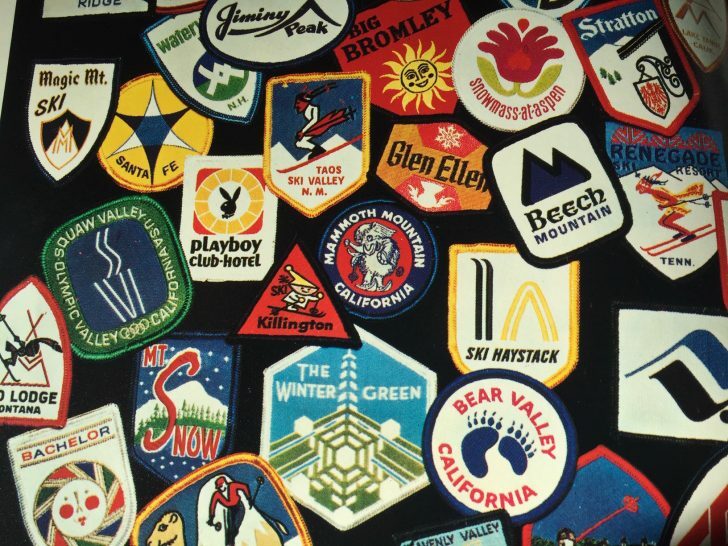 The senior contingent, which grew up skiing cheaply at hundreds of little mom-and-pop ski resorts worldwide, did not notice this power (and money) grab by the industry, and expects to keep on skiing cheap, while the corporate ski resorts want to cleanse the middle class out of all demographics. Basically, we, and all our children and grandchildren, need to boycott the big resorts, and promote the growth of small, local, and community-owned ski areas. Now that the season is almost over (unless you ski the Tahoe area), here’s a summer project for the SS staff. Take a look at summer activities enjoyed by seniors, like golf, tennis, cycling, boating, etc. How many seniors participate, what does it cost them, are they in the same economic bracket as senior skiers? Do they meet similar criteria mentioned in your letter that some feel warrant a discount? Are senior discounts available in these activities? I don’t know the answers, but such research may demonstrate further why senior discounts should be continued, or perhaps it won’t.